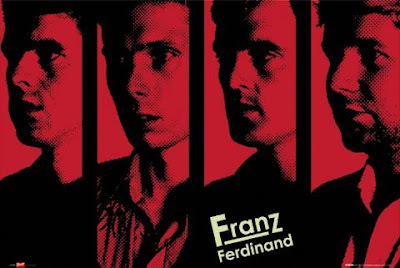 Sixeyes: Franz Ferdinand: A.A. for F.F.? Franz Ferdinand: A.A. for F.F.? After hearing that new Franz Ferdinand song, "Lucid Dreams", I've been on a Glaswegian bender of spiky pop, punky disco, and the kinetic energy that only the over caffeinated metabolism of skinny Brits can conjure. For days now I've been happily digging into the (only) two releases from this quartet, so far, and now I may need some help getting over this 'cause I'm sitting (ok, slumping) in a well worn office chair, the fingernails on my left hand are chewed down to the quick (my right hand rarely leaves the mouse or keyboard), my eyes have grown as dry as the static rippling across a computer screen, and I'm hearing correlations between FF and bands I don't normally allow my mind to entertain, namely ABBA... God, I need help... but not yet, no, no, not yet. Just... one... more.... or two, or three. Yeah, those songs are pretty much one big hook after another which slashs at the guitars and pounds the drums, so even if it was the hyper guitar kick and melodies which hooked me, this ballad by FF is one of the best Beatlesque odes about longing for a far off love I've ever heard. I simply love the imagery which singer Alex Kapronos weaves from his aching heart, aching for his stateside girl, Eleanor Friedberger of The Fiery Furnaces. And I know I don't have to say a thing about the lovely piano and harmonica interludes which for me evoke so much of the sixties in a few brief seconds. Oh yeah, grab that new song, "Lucid Dreams", right here, if you dare. And now to end this I've got a question: Is there an A.A. for F.F.? F.F.A., perhaps?